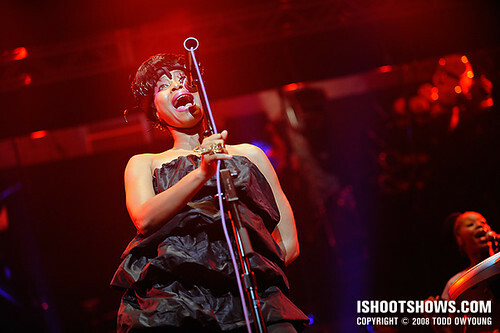 Performing in support of her 2008 release, New Amerykah Part One (4th World War), Erykah Badu delivered an electrifying performance of jazz-tinged Neo-Soul at the Fox Theatre to joyous reception. Draped in loose dress of four ruffled tiers and sporting a feathered hat, the singer took the stage to applause and cheers, wasting little time or banter before launching into a performance of “The Healer,” a track of her new album. 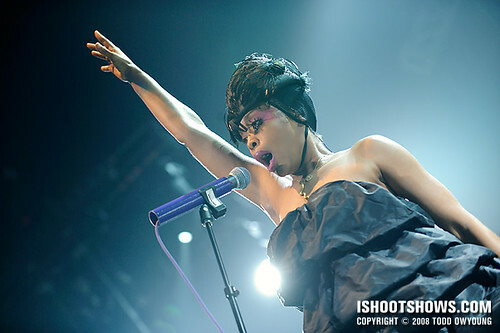 On stage, Badu was a force of charisma, dancing on stage and often leaving the mic to its stand, which left her hands and arms free to snake through the air as she sang. Badu's next album, titled New Amerykah Part Two (Return of the Ankh), is due out next month. This was an interesting shoot, due to restricted movement and only two songs instead of the more conventional three. Shooting locations were primarily restricted to a very narrow gap in front of the stage and three main aisles leading to the stage through the pit seating. Luckily, offsetting these challenges was relatively abundant lighting, thanks to two spotlights from high in the balcony. I shot most all of this set crouching down in the aisles. For the majority of the set, I shot from house right, taking a position that gave me a fair amount of separation between the singer's face and the mic, while avoiding a complete profile. 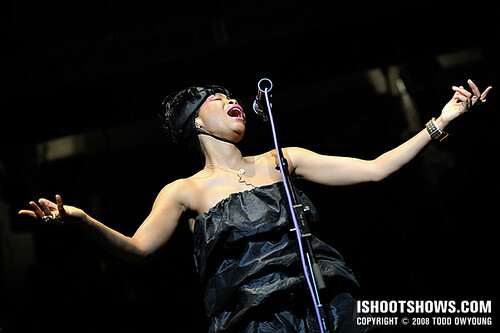 I occasionally moved to the center aisle for a few shots of Badu while she wasn't singing directly behind the mic. One particular moment of hustle came when the Badu dropped to the ground, surveying the audience with a keen stare as she slide back up the microphone stand. As with most shows with such a constant, unvarying light source and limited shooting angles, this performance quickly became all about pose and composition for me. One key balance to shooting Erykah was juggling wide shots to accommodate her expressive, full-body gestures while still shooting tighter images as well. 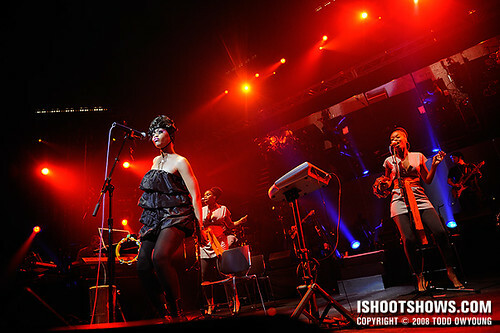 All of the key light on Erykah Badu came from two spotlights, which put out a constant and steady stream of white light. Unlike the smaller spotlights used at the Pageant, which fluctuate in color temperature and tint, the spots used at the Fox Theatre were completely stable. Background lighting was comprised mostly of red accents, with solitary burst of white light during the first song. For the second song, there was a marked absence of strong accent lighting, with just a few dull green lighting effects from the sides. I shot Badu's set using the Nikon D3 and Nikon 70-200mm f/2.8 for most of the first two songs, switching to the Nikon 24-70mm f/2.8 occasionally for wider perspectives. Due to the limited positioning options, the telephoto zoom made the most of the unvaried angles and was essential for this set. 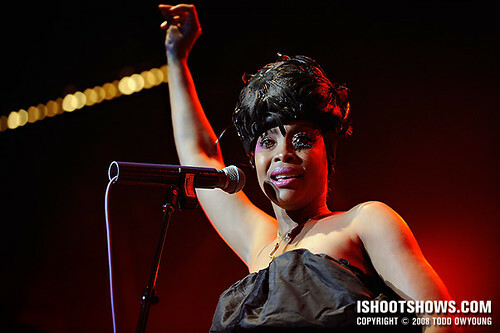 At 70mm the zoom was wide enough to capture Badu's signature gestures while tight enough at 200mm to deliver headshots. Thanks to the very constant lighting, I kept my exposure hovering at f/2.8, 1/500, and ISO 1600. During the end of the set, I lowered the shutter speed by a third-stop and stopped down to f/3.2, keeping the same effective exposure while gaining a little more bite in the images. While the benefit of three songs would have been great for a little more “room” to experiment and change up the angles, the two alloted songs supplied plenty of keepers, in part thanks to the plentiful light. For another perspective on this tour, check out my brother's shots from Radio City Music Hall in New York. Thanks for the feedback, glad to hear your thoughts on it. It’s a pleasure to shoot in a place like the Fox, the productions there are always great. 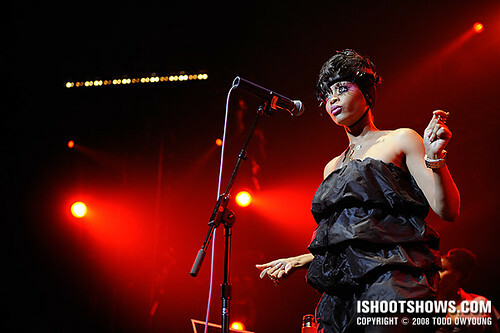 You’re right about the eccentric makeup and dress, it really upped Badu’s performance. In addition, she just put out this wild vibe in her gestures and movements, like she was from another planet. Regarding #6, that’s exactly what I was thinking. It was right before the end of the second song and I thought, “I need a tight vertical portrait.” Ha. The 70-200mm was great for this set. I could have used a little more reach (this is just me occasionally missing the 1.5x crop), but I really do like the wider perspective at 70mm now. It always felt too tight on the D2x/D70. Thanks, as always, for the picks! Thanks for the pick, Artur. 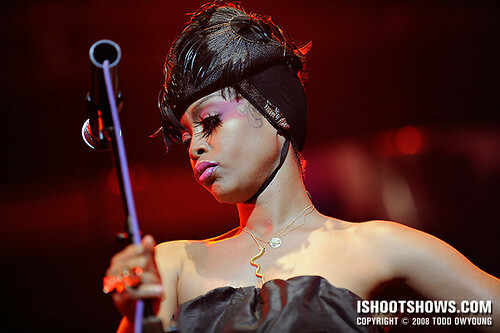 Erykah was full of great poses, she’s a great subject. Wow ! Great pics ! I love 1 and 3 particularly, I’m really thankful that you put a good deal of effort explaining how you handled lighting, exposure etc… it’s really helpful for amateurs like me to get info like that… Of course nothing beats trial and error but i’m addicted to this website ! Hey Achille, thanks! Glad to hear that you appreciate the notes of the shoot, they’re done for other photographers like yourself. Great photos! I love her! Thank u ! Thanks, Amanda! I appreciate it.